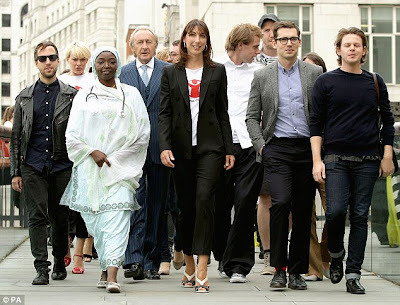 Following in Victoria Beckham's shoes, Samantha Cameron proved the world wrong when she took part in a charity walk with British fashion's finest yesterday in a pair of monochrome (love) heels. She and designers including Erdem Moralioglu, Peter Pilotti and Sarah Burton council stepped out in style to take part, though Samantha was the only one to do so in heels. The walk was to raise money for Save the Children, and raised thousands of pounds for charity - go Sam! She is an ambassador for the charity, and works hard to help them raise funds every year. Find the shoes for £69 here.